The Association was one of the more underrated groups to come out of the mid- to late '60s. Creators of an enviable string of hits from 1966 through 1969, they got caught in a shift in popular culture and the unwritten criteria for significance in that field and never recovered. The group's smooth harmonies and pop-oriented sound (which occasionally moved into psychedelia and, much more rarely, into a harder, almost garage-punk vein) made them regular occupants of the highest reaches of the pop charts for two years -- their biggest hits, including "Along Comes Mary," "Cherish," "Windy," and "Never My Love," became instant staples of AM play lists, which was a respectable achievement for most musicians at the time. 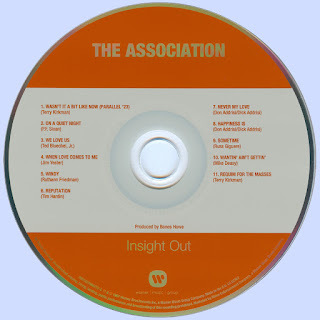 That same sound, along with their AM radio popularity, however, proved a liability as the music environment around them changed at the end of the decade. Additionally, their ensemble singing, essential to the group's sound and appeal, all but ensured that the individual members never emerged as personalities in their own right. The Association was as anonymous an outfit as their contemporaries the Grass Roots, in terms of any individual names or attributes, despite the fact that both groups generated immensely popular hits that millions of listeners embraced on a deeply personal level. The group's roots go back to a meeting in 1964 between Terry Kirkman, a Kansas-born, California-raised music major, proficient on upwards of two dozen instruments, and Jules Alexander, a Tennessee-born high school drop-out with an interest in R&B who was a budding guitar virtuoso. Alexander was in the U.S. Navy at the time, serving out his hitch, and they agreed to link up professionally once he was out. That happened at the beginning of 1965, and they at once pursued a shared goal, to put together a large-scale ensemble that would be more ambitious than such existing big-band folk outfits as the New Christy Minstrels and the Serendipity Singers. The result was the Men, a 13-member band that played folk, rock, and jazz, who earned a spot as the house band at the L.A. Troubadour. The group's promising future was cut short, however, when the group's lineup split in two after just a few weeks with seven members exiting. The remaining six formed the Association, the name coming at the suggestion of Kirkman's wife Judy. Ted Bluechel, Jr. was their drummer, Brian Cole played bass, Russ Giguere was on percussion, and Jim Yester, brother of Easy Riders/Modern Folk Quartet alumnus Jerry Yester, played rhythm guitar behind Alexander. Each member was also a singer -- indeed, their vocal abilities were far more important than their skills on any specific instruments -- and several were multi-instrumentalists, able to free others up to play more exotic instruments on stage. The group rehearsed for six months before they began performing, developing an extremely polished, sophisticated, and complex sound. The Association shopped itself around Los Angeles but couldn't do any better initially than a single release on the Jubilee label -- their debut, "Babe, I'm Gonna Leave You," wasn't a success, nor was their subsequent 1965 recording of Bob Dylan's "One Too Many Mornings" on Valiant Records, which was an early folk-rock effort that was probably a little too complex for national exposure -- though it got decent local radio play in Los Angeles. The group came completely into its own, however, with the recording of the singles "Along Comes Mary" and "Cherish." The recording of those songs was to set a new standard in the treatment of rock music in America. As Ted Bluechel recalled in a 1984 Goldmine article by Marty Natchez, the voices were recorded at Columbia studios, while the instruments -- played by Terry Kirkman and Jules Alexander, plus a group of studio musicians -- were cut in an improvised four-track studio owned by Gary Paxton. Those two songs, and the entire album that followed, revealed a level of craftsmanship that was unknown in rock recordings up to that time. Producer Curt Boettcher showed incredible skill in putting together the stereo sound on that album, which was among the finest sounding rock records of the period. The fact that most of the members didn't play on their records was not advertised, but it was a common decision in recording in those days -- Los Angeles, in particular, was home to some of the best musicians in the country; they worked affordably and there was no reason to make less-than-perfect records. Even the Byrds, apart from Roger McGuinn, had stood on the sidelines when it was time to do the instrumental tracks on their earliest records, although this sense that the Association's music was a "production" rather than the work of an actual band probably helped contribute to their anonymity as a group. 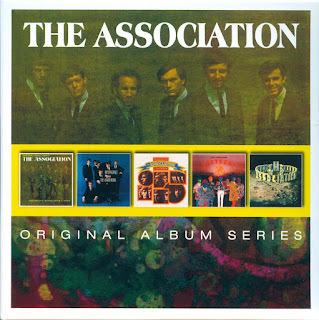 Considering their lightweight image in the later 1960s, the Association made a controversial entry into the music market with "Along Comes Mary" -- apart from its virtues as a record, with great hooks and a catchy chorus, it was propelled to the number seven spot nationally with help from rumors that the song was about marijuana. No one is quite certain of what songwriter Tandyn Almer had in mind, and one wonders how seriously any of this was taken at the time, in view of the fact that the song became an unofficial sports anthem for Catholic schools named St. Mary's. "Cherish," a Kirkman original (which was intended for a proposed single by Mike Whelan of the New Christy Minstrels), was their next success, riding to number one on the charts. Among the most beautiful rock records ever made, the song has been a perennial favorite of romantic couples for decades since. 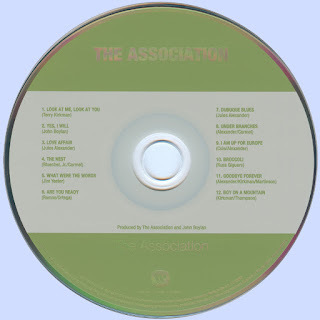 The group's debut album And Then...Along Comes the Association reached number five late in 1966. It was just at this point that the exhaustion that came with success and the avarice of their record label, along with a couple of artistic and commercial misjudgments, combined to interrupt the group's progress. Their next single, "Pandora's Golden Heebie Jeebies," was not an ideal choice as a follow-up to one of the prettiest and most accessible rock records of the decade, reaching only number 35, and "No Fair at All," the next single, also fared poorly. Equally important, the group was forced to rush out a second album, Renaissance (produced by Jim Yester's brother Jerry Yester), while they were honoring the burgeoning tour commitments attendant to a pair of huge national hits. It was also during this time that Valiant Records, including the Association's contract, was absorbed by Warner Bros. Records. A major personnel problem also arose as Jules Alexander, one of the core players in the group, decided to leave. He headed off to India, where he spent most of the next year. He returned in 1967, intending to form his own group, which never got off the ground. In the meantime, the Association recruited multi-instrumentalist Larry Ramos of the New Christy Minstrels to replace Alexander. The group's lineup change coincided with their getting access to a song by Ruthann Friedman called "Windy." Another number one single, it was tougher to realize as a finished work, cut over a period of 14 hours with Friedman and Yester's wife, arranger Cliff Burroughs, and his wife, along with numerous others, all singing with them. Insight Out, their third album, was a tough one to record as well. Initially to have been produced by Jerry Yester, it fell apart after it was half done when the group became unhappy with the sound and shape he was giving it. Instead, they turned to Bones Howe, an engineer and producer (most noted for his work with the Fifth Dimension, among many other popular acts), who finished the album with them. Insight Out was a better album than Renaissance, with pop, folk-rock, and hard rock elements that hold together reasonably well, although its audio textures lacked the delicacy of the group's debut long-player. The album's two hits, "Windy" and "Never My Love," were among their most popular and enduring records and helped drive sales of the 12" platter. The final track, "Requiem for the Masses," which featured a Gregorian chant opening, was a strange song mixing psychedelia and social commentary -- its lyrics were a searing social indictment, originally dealing with the death of boxer Davy Moore (Bob Dylan had written a song, very little known at the time, on the same subject four years earlier). Immediately prior to the release of Insight Out, the group played the most visible live gig in their history, opening the Monterey International Pop Festival. The group didn't seem absurdly out of place, in the context of the times, on a bill with Simon & Garfunkel, the Who, Jimi Hendrix, Janis Joplin, Eric Burdon and the Animals, and the Mamas & The Papas. It was an ideal showcase, and as the tapes of the festival reveal, the group was tight and hard that night, their vocals spot-on and their playing a match for any folk-rock band of the era -- Ted Bluechel's drumming, in particular, and Larry Ramos's and Jim Yester's guitars are perfect, and even Kirkland's flute came out well on stage. 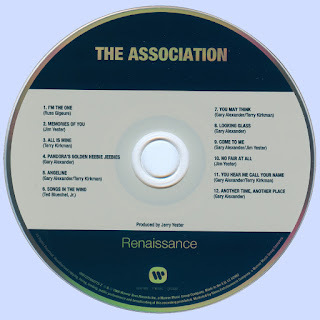 Had any part of their Monterey set been released, it might've helped correct the image that the Association were rapidly acquiring of being a soft, pop/rock group. Instead, their performance took some 20 years to see the light of day and longer than that for a pair of songs to show up on CD. The group's next album, Birthday, was a departure from its three predecessors, their attempt at creating a heavier sound. It was around this same time that they cut the single "Six Man Band," a very nasty critique of the music business written by Kirkman. 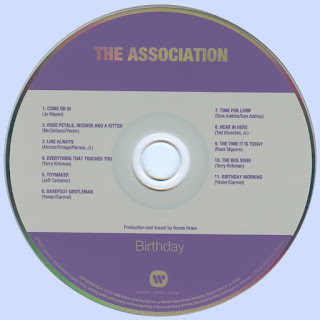 The measures that the group took to change its image came too late -- Birthday fell largely on deaf ears when it was issued in 1968, and the singles "Six Man Band" and "Enter the Young," the latter a re-recording of a song that highlighted their debut album, charted only moderately well. Warner Brothers' release of a greatest hits album in 1969 boosted the group's album sales and consolidated the audience that they had, but did nothing to stop the rot that had set in. By 1969, the sensibilities of the rock audience had hardened, even as that audience splintered. Suddenly, groups that specialized in more popular, lighter fare, usually aimed at audiences outside the 17-25 age group, and especially those with a big AM radio following, such as Paul Revere and the Raiders and the Grass Roots, and the Association were considered terminally out of fashion and uncool by the new rock intelligentsia. If they got mentioned or reviewed in the pages of Rolling Stone, Crawdaddy, or Circus magazine, it was usually for a lark rather than in a fully serious context. They were usually lumped together with bubblegum acts such as the 1910 Fruitgum Company and the Ohio Express and represented the kind of music you left behind (especially if you were a guy) once you got out of ninth grade, if you had any intentions of being considered cool.